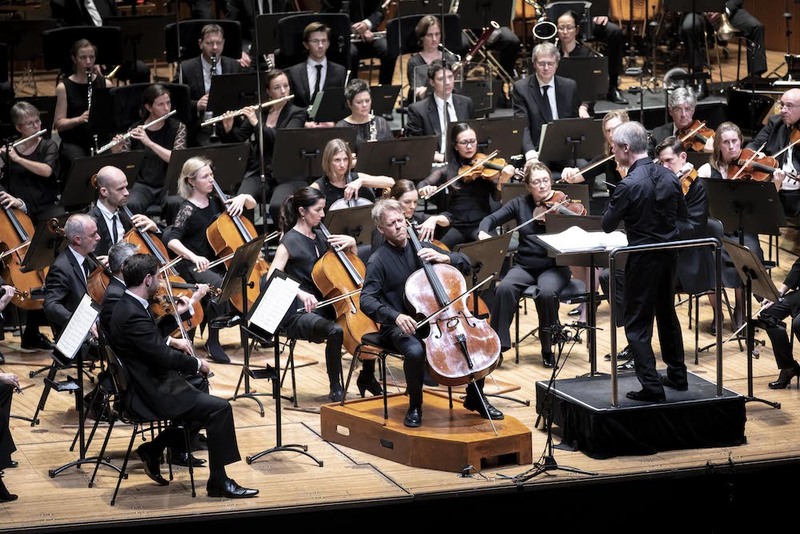 We tend to think of concertos as bravura showpieces for a soloist, but Brett Dean’s new Cello Concerto for Alban Gerhardt, which had its world premiere with the Sydney Symphony Orchestra conducted by SSO Chief David Robertson, invited the audience into a more intimate sonic world of mingling voices. Drawn in part from Dean’s solo work Oblique Strategies – which was written for the 2014 Emanuel Feuermann cello competition (and which Gerhardt workshopped with the composer) – the Cello Concerto requires large forces (and a large percussion section) but they’re arrayed not so much for power as a mesmerising depth of colour. Unlike Dean’s other concerti, the Cello Concerto has no extra-musical title or program – the music itself, however, is vivid and evocative. Gerhardt, who performed from memory with focussed intensity and a deliciously mellow timbre, opened with soft, distant bird-call gestures, the Concerto unfolding less through a traditional soloist-ensemble relationship than with the cello’s sound augmented by the orchestra, smearing and radiating out from the centre of the stage. Gerhardt was haloed by winds, echoed in murmuring trombone, his notes rippling (sometimes splashing) into the string section. Contrabass clarinet and Hammond organ extended the ensemble’s palette even further, Dean making use of everything from solo voices to tutti orchestral fury. Dream-like moments drifted into more agitated passages, Gerhardt weaving virtuosically through the orchestra, relishing the tender moments and setting off a raucous frenzy in the ensemble as the Concerto reached its climax, before winding its way to a smouldering finish, a final curl of sound spiralling upwards like smoke. The Concerto, particularly in the hands of an advocate as fine as Gerhardt, is a fascinating, multi-hued work that will no doubt reward repeated listening. For an encore, Gerhardt gave us the Prelude from Bach’s Sixth Cello Suite, bringing to the piece a similar balance of subtlety and fire. Robertson opened the program with Elgar’s Serenade for strings in a sweetly lyrical reading that set the stage for the Dean without overpowering the sonic palate, balanced at the other end of the program by Brahms’s Fourth Symphony. Robertson began the Allegro non troppo with a restrained beauty, but its dovetailing lines soon built into a lithe account notable for its pristine clarity. Stravinsky once described Brahms’s music as “turgid and graceless” but nothing could be further from the truth in this rendition, Robertson bringing his trademark elegance to Brahms’s music and a sense, particularly in the first movement, of finely paced escalation. The SSO horns were in fine form throughout, while the strings in the second movement were sublime. “It’s also one of my favourites,” Robertson said with a smile as the audience applauded at the end of the movement. The Scherzo was ebullient, humming with taut energy, before he launched into the final movement – of which the gleaming solo from guesting flautist Christie Reside was a highlight – bringing the evening home with drama and irresistible force.